So this weekend sees the MYA Trade Show and AGM taking place on Saturday at Rowheath pavilion in Birmingham. The DF Racing Association will have a presence at the show in the form of our exhibition stand which will form the backdrop to the RC Yachts trade stand. Membership secretary Wayne Stobbs and class Chairman Keith Coxon will be in attendance and they should be able to answer any questions. DF Racing product suppliers will be attending too, including Mike Weston of RC Yachts, Catsails for sails and accessories, Housemartin Sails along with several other suppliers who can offer DF Racing products. 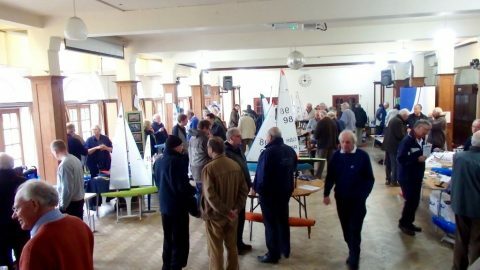 Notable absentees will be John Tushingham (Graphite) and Tim Long (Soch Sails), who both have prior engagements and will be unable to attend the show this year. Refreshments are available all morning and there is usually a very good biscuit selection. Doors open at 10 ish and the trade show is followed by the MYA AGM whihc is well worth staying for to catch up on all of the years goings on and to see what is planned for the forthcoming year . A previous trade show – Photo Unkown. So we concluded the DF Racing TT series yesterday with the DF95 racing at Lincoln and we have a winner. A Mr Tushingham of Ilkley seemed to do rather well throughout the season and has come out top of the pile and scoops a very nice trophy for his fireplace. So I’m back at HQ for a brief hour or two having spent another day tramping up and down the bank at Lincoln MYC. Today we notched up a mere 5.5 Miles again, this time under a big blue sky with some scudding fluffy clouds to show us that the breeze was definitely there. An early kick off meant that there were still a few underperforming skippers during the morning session including JT who used two of his three discards in the first couple of races. Uncle Derek took the first from Snackers and Buzz. Race 2 was Ken from Buzz and Mike and it wasn’t until race 3 that JT found the front of the fleet however he wasn’t to win another race until the afternoon session when he really perked up a bit. In reality there was no standout performance from any one skipper today, there were consistency issues for many skippers who found the conditions challenging with almost all the skippers catching some ‘salad’ in each race. Whilst it doesn’t stop a DF95 dead like it can do with a 65 it does make a noticeable difference to the performance and if you could get into remove it you certainly saw the difference, but could you cope with the places you lost in performing the task. And so began salad roulette. So the race wins were shared between the top five or so skippers with overall scores being a little higher than usual across the fleet. The day ended with JT top of the pile, Buzz sailed well to pip Mike Weston to second by a single point with Ken in 4th, Derek 5th, Snackers 6th and Liz in 7th having had a great days sailing. Prizes were handed out as were the overall series prizes. So that concludes the 2017 DF Racing TT Series and with more than 150 skippers taking part we’ll call it a success. Next season kicks off at West Lancs in February when we will start another TT series. Some of today’s winners pictured below along with the results sheet. So if you’ve ever wondered how the DF Racing crowd take their social, let me tell you it’s seriously…..
A forecast of some showers followed by some afternoon sunshine were about right, the breeze didn’t do quite what had been suggested which meant a day of A plus sailing for most with a couple of races in A suit for some. As ever the Lincoln race team were super organised and ran a great day of racing and along with the tea ladies the competitors were kept fed and watered through the day. The racing itself ended up being somewhat predictable at the top of the scoreboard with JT taking top spot including a brace of 5th place scores to count it certainly wasn’t the usual whitewash. The usual bunch fought it out along with the 21 skippers and in the end the best of the rest was Derek Priestley followed in third spot by Tim Long. Fourth to sixth were covered by just 8 points with Weston, Ken and Peter Baldwin in that order. The rest of the fleet were similarly close with the usual battles taking place and keeping everyone on their toes. The final day of the TT series happens tomorrow and with a slightly better overall forecast it promises to be a cracker. So after 5.5 miles of walking we are off to the pub!